Edward “Ed” James Dagdick.,61, of Ingleside Illinois, passed away on Tuesday March 26, 2019. Visitation will be held at 2:00pm-8:00pm Friday March 29, 2019 at Kisselburg-Wauconda Funeral Home 235 North Main Street in Wauconda, Illinois 60084. The Fire Department as well as all serviceman walk through will begin at 6:00pm. The funeral service will be held on Saturday March 30, 2019 at Transfiguration Catholic Church 348 W. Mill St. Wauconda at 10:00 am. Please meet at church. Interment will follow the at Millburn Cemetery 18550 W. Millburn Rd. Old Mill Creek, Illinois 60083. Ed was born in Chicago on March 20, 1958, to the late Cecile McNamara and Edward Dagdick. He graduated from Wauconda High School and continued on to receive a Bachelors’ Degree in Psychology from Lakeland College. Ed was married to Laura Graves on August 4. 2002; they were together for 21years and married for 16 years. 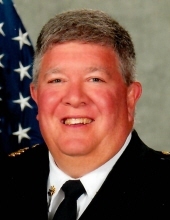 Ed worked as a dedicated Firefighter for Wauconda Fire Department for 38years, retiring as a Deputy Chief for Wauconda Fire Department. His career history includes Flight For Life Medic, actively involved in Firefighter Instruction at McHenry County College and IFSI. He enjoyed spending time with his family, friends, children and grandchildren, cheering on his Chicago Cubs & Blackhawks, camping with his family and working on Lionel train sets. Ed is survived by his wife Laura Dagdick, his children Sarah Schmidt, Kelley Dahl, Kathleen Dagdick, Rick Graves, Jonathan Graves, his grandchildren Ricky Graves, Emma Schmidt, McKenna Schmidt, Everleigh Dahl and other family and friends. In lieu of flowers memorial donations may be given to St. Jude Children’s Research Hospital (www.stjude.org) or Juvenile Diabetes Research Foundation (www.jdrfillinois.org). The family of Ed Dagdick wishes to thank St. Jude’s and The Juvenile Diabetes Research Foundation. To send flowers or a remembrance gift to the family of Edward J. Dagdick, please visit our Tribute Store. "Email Address" would like to share the life celebration of Edward J. Dagdick. Click on the "link" to go to share a favorite memory or leave a condolence message for the family.